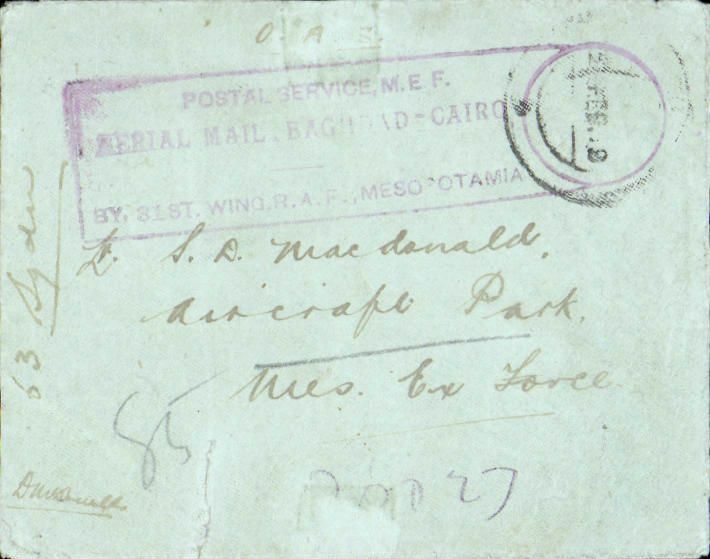 RAF Cairo-Baghdad Air Mail Service, RARE cover flown by Nuttall & Boyd from Baghdad, postmarked FPO 55, Baghdad /24 Feb 19 cds (only date legible), to Cairo via Damascus and Ramadi, bs at Army Post Office, Cairo on 2 March, violet framed "Postal Service M.E.F./ Aerial Mail, Baghdad-Cairo/ by 31st wing RAF, Mesopotamia" cachet, also ms '63 Squadron' and what could be the signature of one of the pilots Capt F.Nuttall. 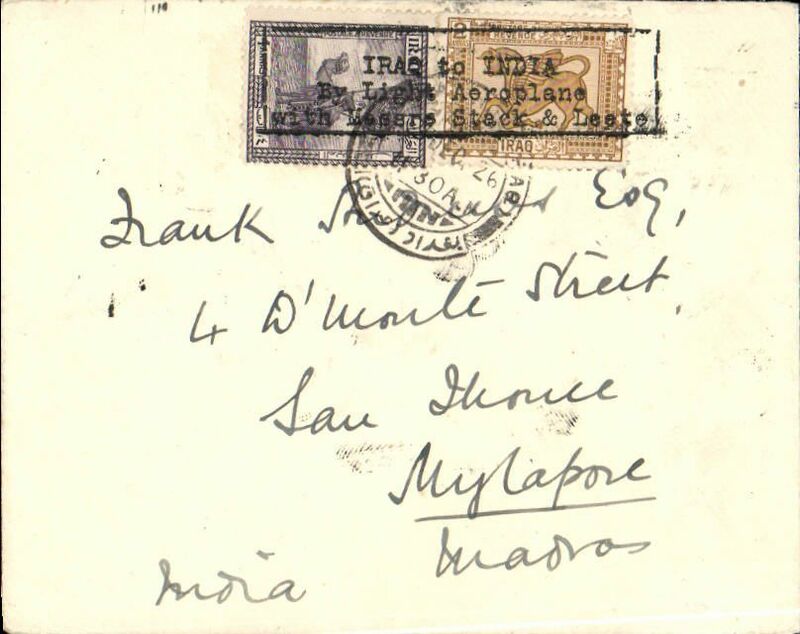 Returned to sender (address Mesopotamia Expeditionary Force) by surface & backstamped at FPO55 Baghdad on 8 April. This was the first experimental flight to explore the route, and antedtated trial flights lin May & June that year, and the first proving flight in August 1921. Very few items from this flight have survived. 20mm closed bottom on bottom edge, does not detract (see scan). 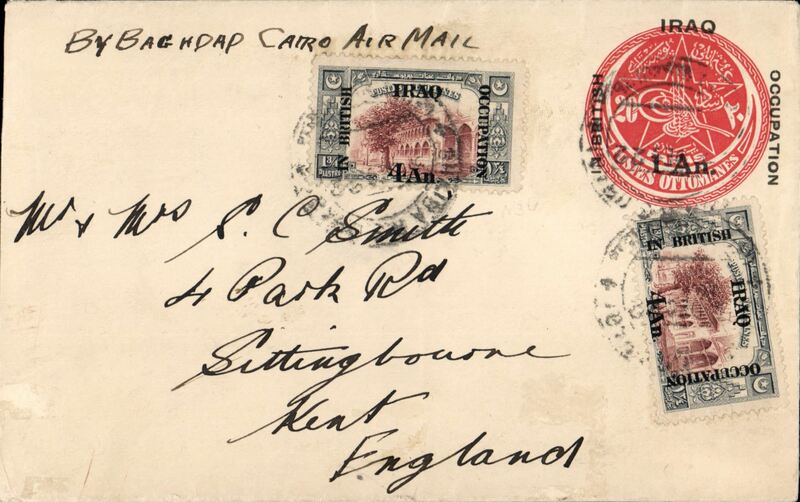 RAF Cairo-Baghdad Service, Baghdad to London via, RAF Baghdad to London, Imperial Bank of Persia cover, correctly rated 9 annas (1918 "In British Occupation" 4 annas x2 and 1 anna, canc Baghdad cds. nice strike violet two line 'By Air Mail/Baghdad-Cairo'. 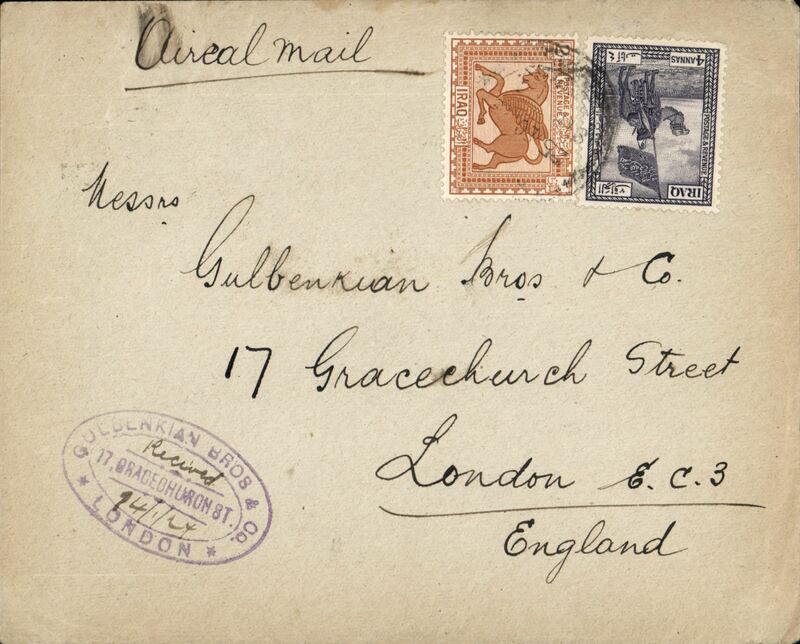 Early airmail, Baghdad to London via, RAF Baghdad to Croydon, arrival ds 4/2 on front, plain cover addressed to D. Field, Dover St, franked 1918 "In British Occupation" 1an/20p and 8an/2 1/2p, canc Baghdad cds. 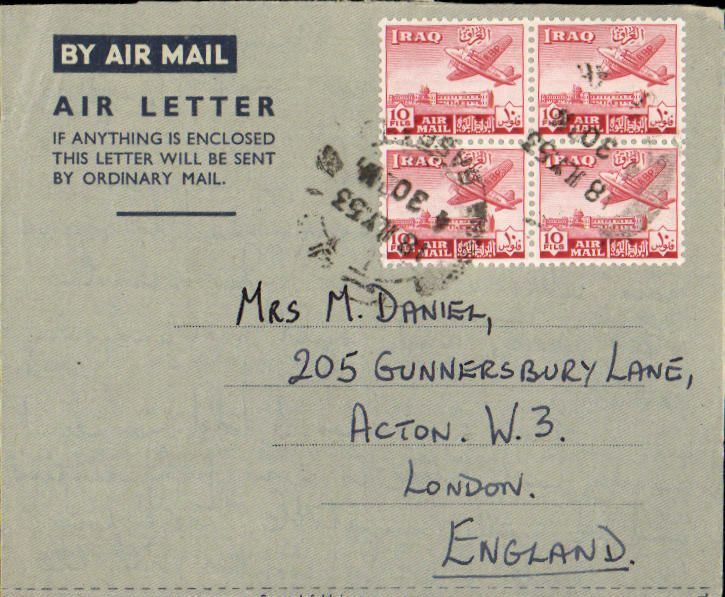 RAF Cairo-Baghdad Service, Baghdad 'Internment Camp' to London, OHMS cover typed 'Air Mail' with embossed logo on flap franked 2 1/2a x3 and 1a x2 ‘On State Service’ stamps verso canc double ring cds's which are difficult to read apart from a clear " *******internment/21 Jul 22". Interesting item with uncommon cover and scarce postmark. RAF Cairo-Baghdad Service, Shaibah to London, scarce Iraq 'In British Occupation' red/cream 1a PSE (H&G B1, cat $75 in 1980), uprated with two addtional 'In British Occupation/Iraq' 4a opts, canc Shaibah cds, via Baghdad 7/12 verso. Correctly rated 9a as from Dec 1922. RAF Squadron 84 was based at Shaibah, a small village seven miles from Baghdad, from 1920-1940. 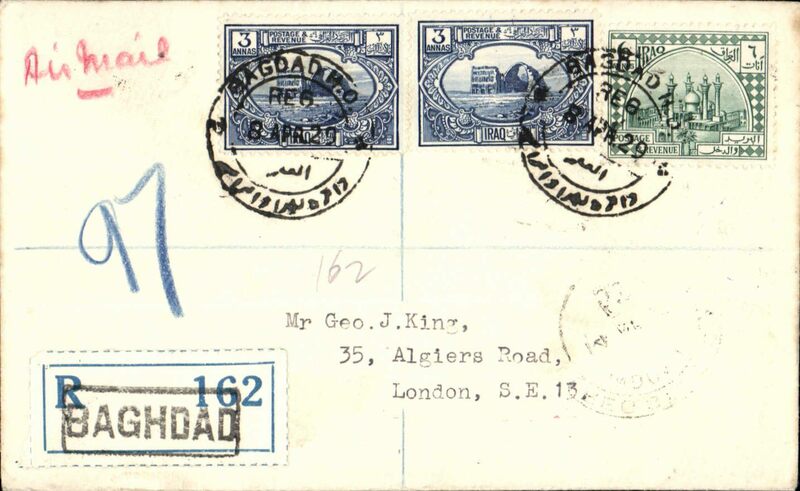 Baghdad to England, carried by the RAF Cairo-Baghdad-Basra service from Hinaidi, Baghdad to Heliopolis, Cairo, envelope imprinted on flap with the blue RAF eagle and crown insignia, franked three Turkish 1 1/2P stamps, 1914 issue, opt 1918 British Occupation 3 annas, canc Baghdad dr cds. Attractive item in fine condition. 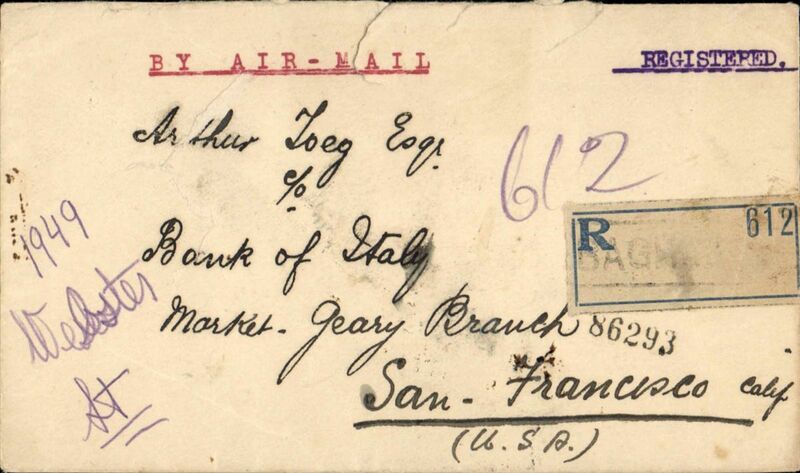 Early acceptance of mail for USA for carriage on the RAF Cairo-Baghdad Airmail Service, Baghdad to the Bank of Italy, San Francisco, b/s, via Cairo 29/7, and New York ,oval transit ds, registered (label) cover rated12 annas (3a + 6a special air mail + 3a registration), date of postage illegible, typed "By Air Mail", black/grey green Iraq airmail etiquette RQ-A-1a, rated rare by Mair. A scarce acceptance for this pioneer service. 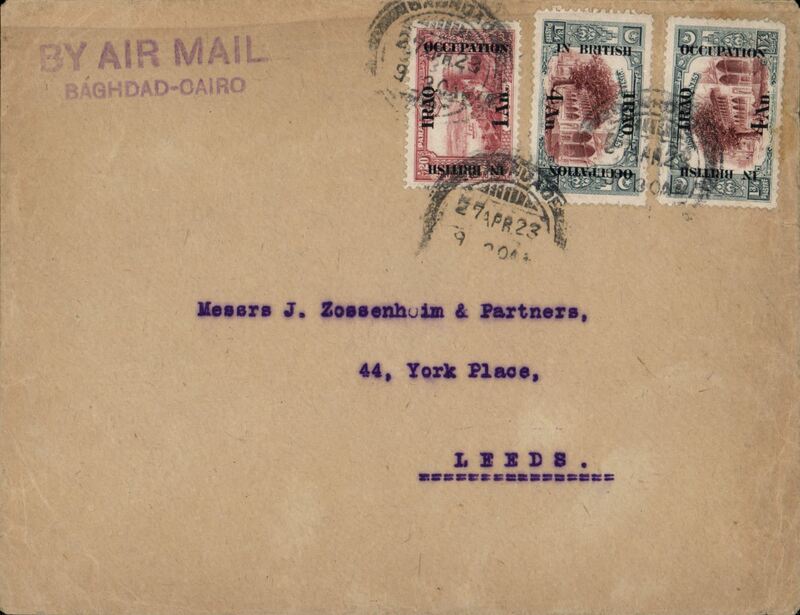 RAF Cairo-Baghdad Service, Baghdad to London, 14/1/24 company arrival ds on front, plain cover addressed to Gulbenkian Bros franked 6 annas canc Baghdad cds, ms 'Aireal Mail'. 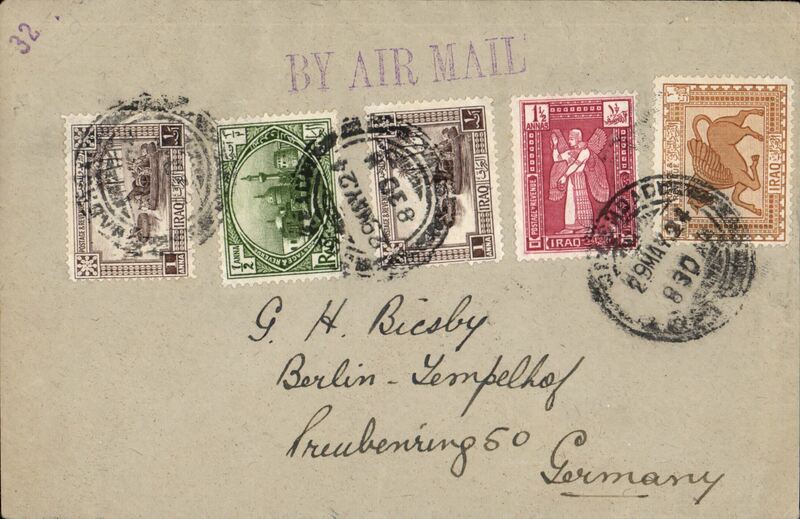 Baghdad to Germany, bs Berlin/11.6.24/Templehof cds, plain cover franked 6 annas, canc Baghdad cdsm fine strike 'By Air Mail' hs. RAF desert air service, Baghdad to London, bs hooded registered 25/10 cds, and on to Scotland, bs oval registered 26/10 ds, reg (label) cover franked 9 annas, canc Baghdad Oct 16, 1924 cds, flown to Cairo on the RAF desert air service, then P&O liner to England, pale green/black airmail etiquette. Good example of 9/10 day accelerated transit time. 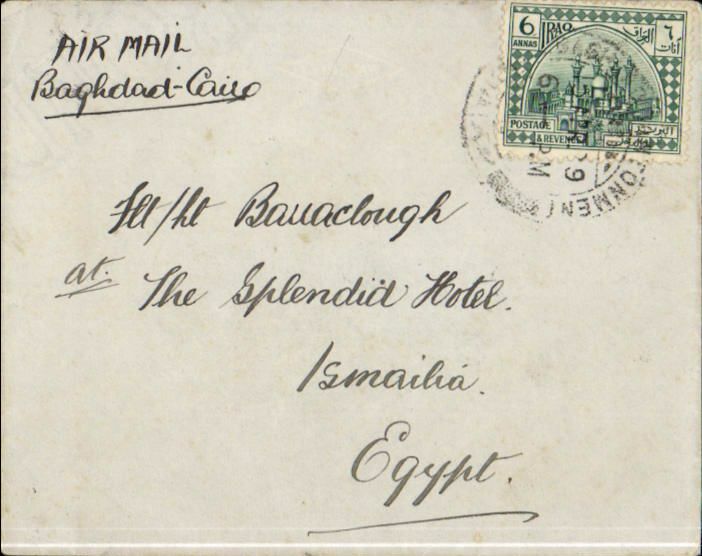 Stack and Leete special flight Baghdad to Karachi, bs Mylapore 13/1/27, plain cover franked 6 annas, canc Baghdad 21 Dec 26 cds, also tied bt black framed "IRAQ to INDIA/By Light Aeroplane/Messrs Stack and Leete" cachet. 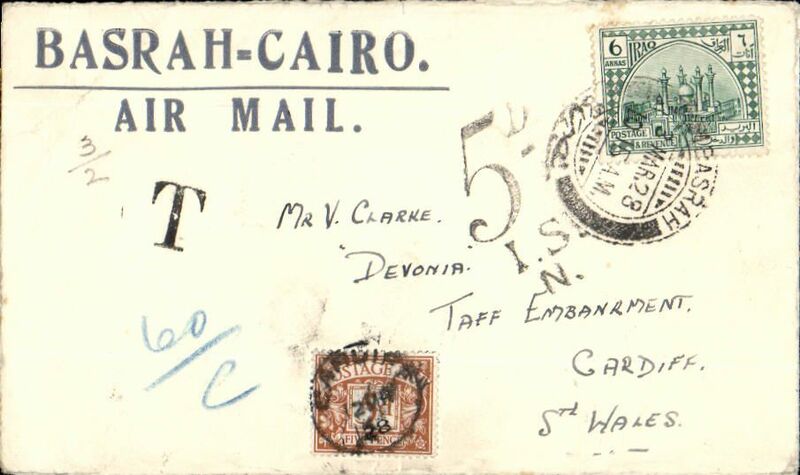 Underpaid airmail cover from Basrah to Cardiff, UK, plain cover franked 6 annas canc Basrah cds, GB 5d postage due canc Cardiff 12 Mar 28 cds on front, fine strike large blue two line "Basrah-Cairo/Air Mail" hs, also black 'T' and '5d I.S. */N' underpaid hand stamps. RAF Basrah-Cairo service, underpaid airmail cover, Basrah to Cardiff, UK, red framed imprint airmai etiquette cover, franked 8 1/2 annas canc Basrah cds, GB 1d postage due canc Gainsborough 25 Dec cds on front, also black 'T' in circle and '1d I.S.underpaid hand stamps, three small wax seals verso. 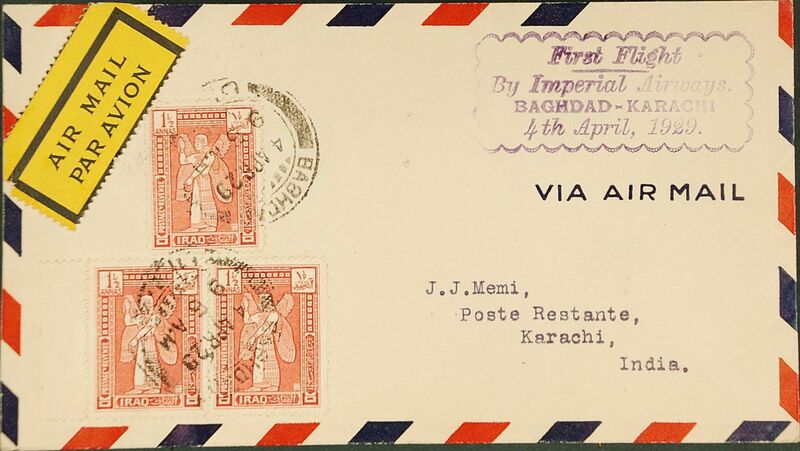 Imperial Airways England-India via Baghdad, first regular service Baghdad to Karachi, bs 6/4, plain cover franked 4 1/2a canc. Baghdad cds, scarce purple oval cachet "Airmail/England-India Route/Baghdad/April 3, 1929/First Flight". 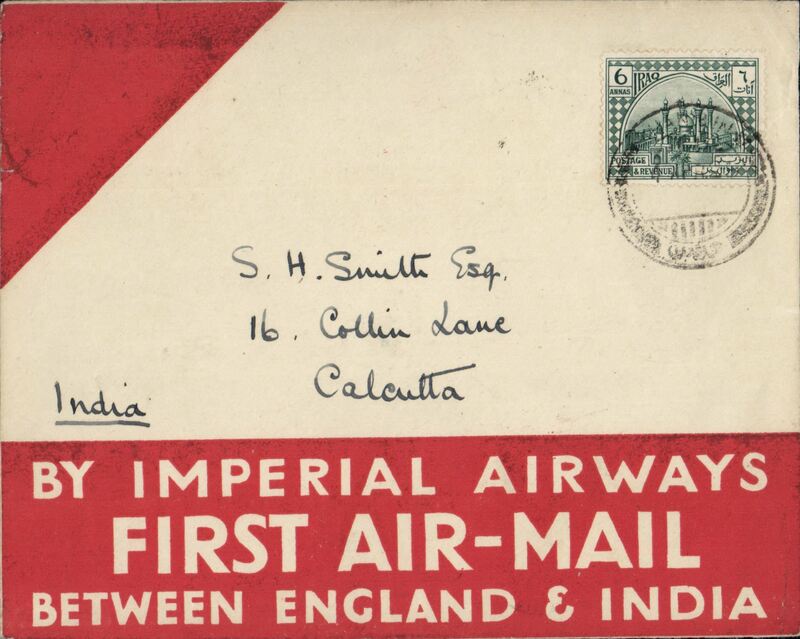 First acceptance of airmail from Iraq for carriage on the Imperial Airways first regular service from Croydon to Karachi, Basra to Calcutta, bs 16/4, red/cream souvenir cover, franked GV 1/-. Flown F/F Basra to Karachi then fowarded to Stephen Smith's home address in Calcutta to ensure safe receipt. Authenticated by original (not facsimile) signature of Stephen Smith. A fine item in pristine condition. 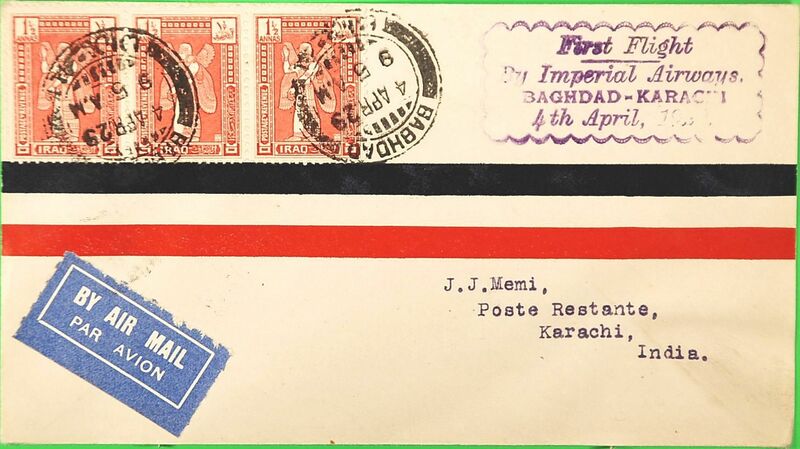 Imperial Airways England-India via Baghdad, first regular service Baghdad to Karachi, no arrival date stamp, red/blue stripe airmail cover franked 4 1/2a canc. Baghdad cds, purple scalloped cachet "First Flight/By Imperial Airways/Baghdad-Karachi/4th April 1929". 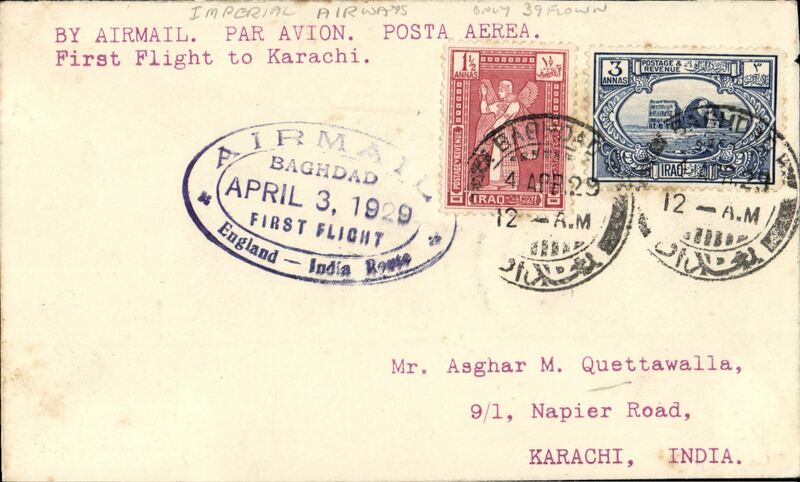 First regular service to India, Baghdad to Karachi, bs 6/4, franked 4 1/2a canc Baghdad cds, purple scalloped cachet "First Flight/By Imperial Airways/Baghdad-Karachi/4th April 1929", black/yellow airmail etiquette, Imperial Airways. 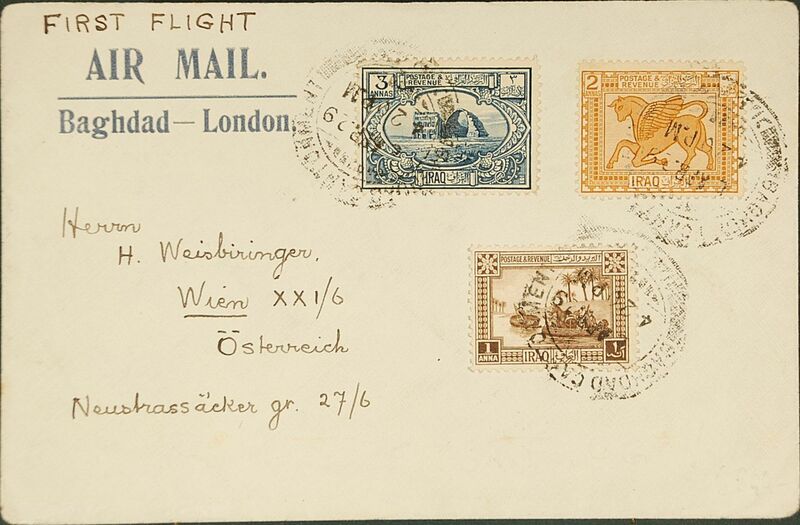 Baghdad to Vienna, no arrival ds, via Cairo, 10/4 transit cds, carried on Imperial Airways F/F Baghdad to England, franked 6a canc Baghdad Cantonement dr cds, blue/cream "Air Mail/Baghdad-London" corner cover ms "First Flight". 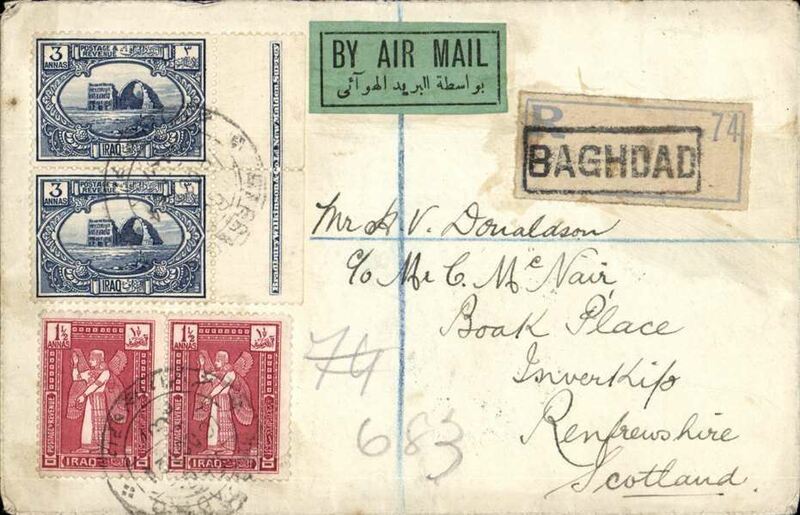 Imperial Airways, F/F Baghdad to England, registered (label) cover franked 12annas, canc Baghdad cds, bs London '14 AP 29' hooded registered cds, carried by "The City of Baghdad". Rated 110 units by Newall, p108, registered covers are even scarcer. 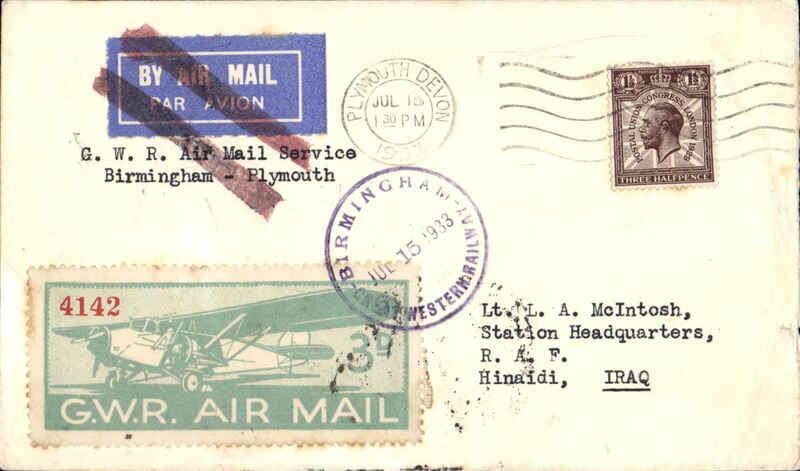 F/F Baghdad to England, no arrival ds, franked 6a canc Baghdad Cantonement dr cds, blue/cream "First Flight/Air Mail/Baghdad-London" corner cover ms "First Flight", Imperial AW. 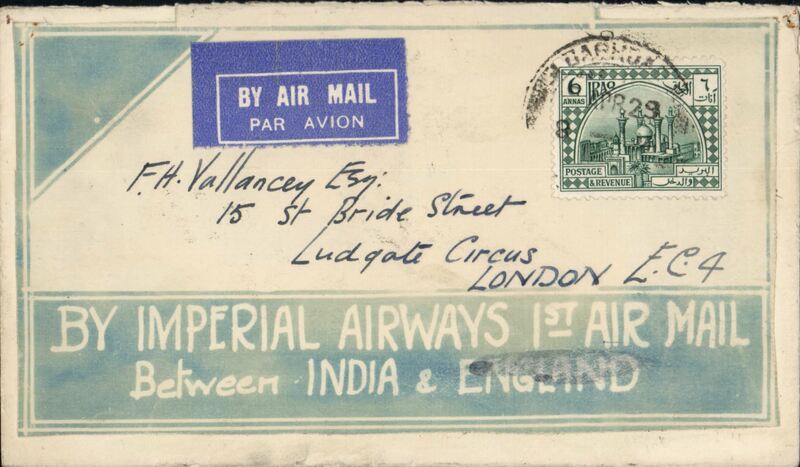 F/F Baghdad to England, no arrival ds, rare green/cream cover 'By Imperial Airways 1st Air Mail/between India & England' and 'Keep This Envelope' verso, franked 6annas, airmail etiquette. 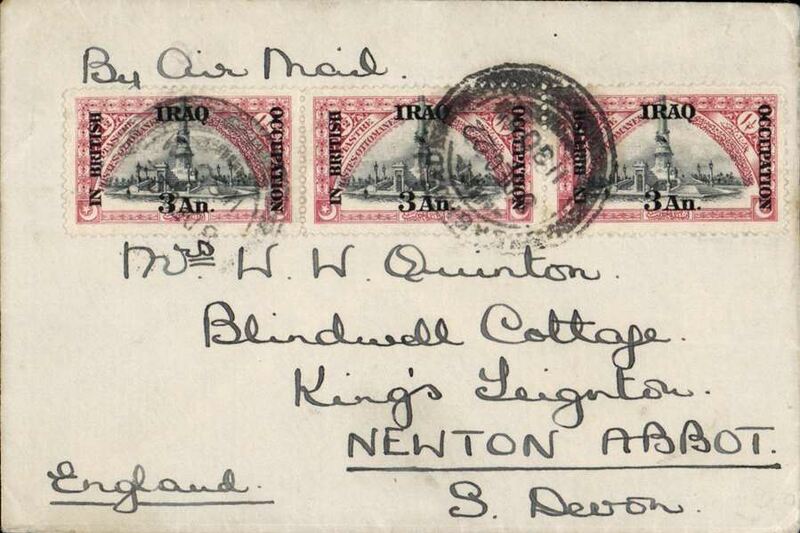 Baghdad to Cairo airmail, Baghdad to Ismailia, Egypt, bs 19/4, via Alexandria 17/4, 70 Squadron RAF cover with blue demi-wing lion and '70 Squadron RAF' embossed on flap, franked 6 annas. Moved to Iraq in 1923 and re-equipped with Vernon bombers/transports which were flew on the Cairo-Baghdad air mail run until 1927. During this time, the Squadron also took part in operations against rebel tribesmen and insurgents on the Turkish frontier and received Victorias shortly before the famous evacuation of Kabul in 1928. 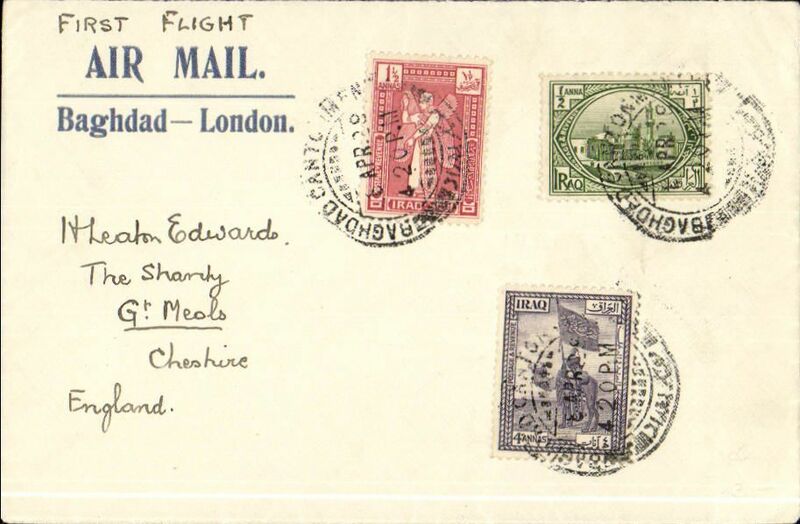 Imperial Airways air cover, Hinaidi to London, no arrival ds, franked 51fls, canc Hinaidi cds. 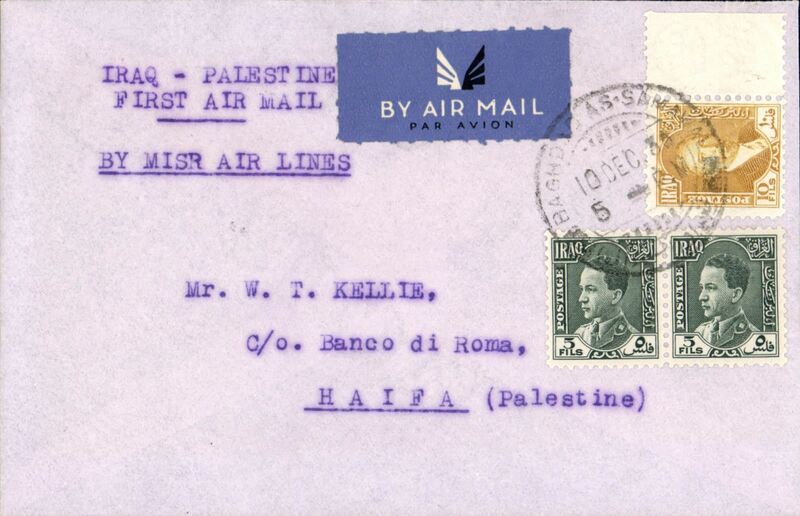 MISR Cairo–Cyprus–Haifa–Baghdad service, F/F Baghdad to Haifa, bs, Imperial Bank of Persia cover franked 20fls, typed 'Iraq-Palestine/First Air Mail/By MISR Air Lines'. Scarce. 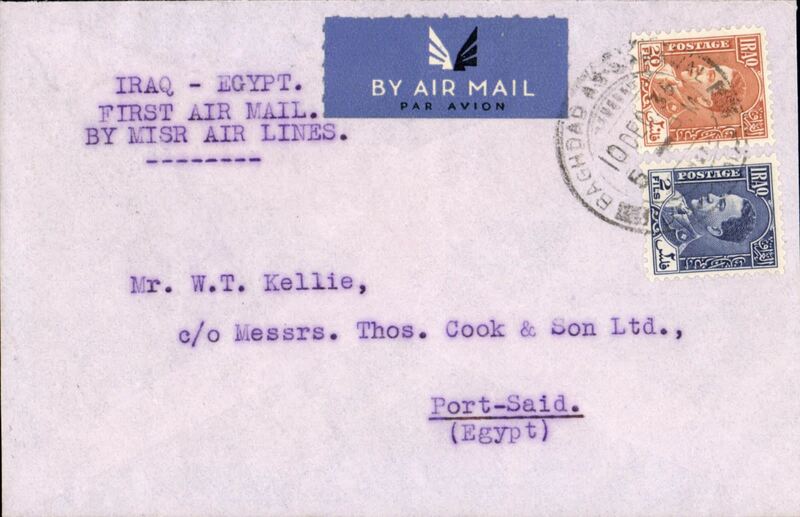 MISR Cairo–Cyprus–Haifa–Baghdad service, F/F Baghdad to Port Said, bs 11/12, Imperial Bank of Persia cover franked 22fls, typed 'Iraq-Palestine/First Air Mail/By MISR Air Lines'. Scarce. 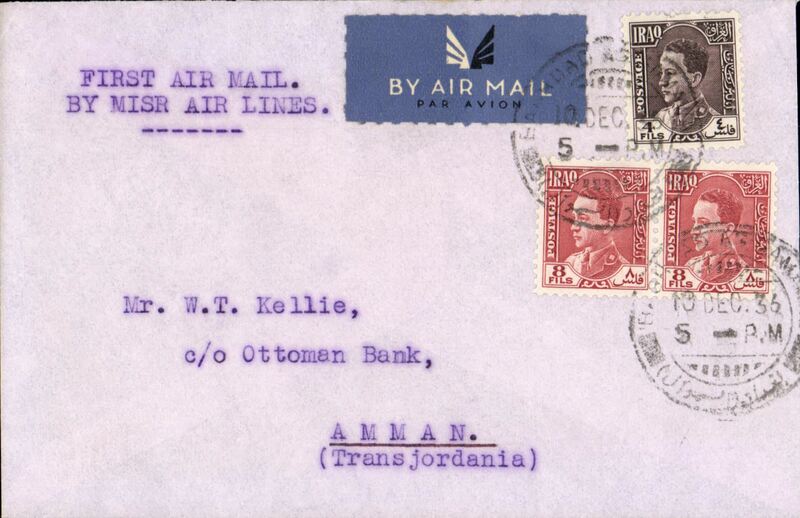 MISR Cairo–Cyprus–Haifa–Baghdad service, F/F Baghdad to Amman (Jordan), bs,Imperial Bank of Persia cover franked 20fls, typed 'Iraq-Palestine/First Air Mail/By MISR Air Lines'. Scarce. Early World War II censored airmail cover to Connecticut, USA, no arrival ds, franked 70 fils, canc 'Basrah/28 Jun 40/Sor' cds, typed endorsement "Airmail Via Durban", crude black winged airmail hand stamp cancelled by a red distorted London "three" bar Jusqu'a applied in London (see illustration on p85, Jusqu'a Air Mail Markings, Part 1, Ian McQueen, 1993), sealed PC90 OBE 4206 (Bermuda) censor tape. Carried by BOAC from Basra to Durban on the second westward flight of the Horseshoe Route (see Aitink H and Hovenkamp E, 2005), then by sea to Great Britain, then by trans Atlantic merchant ship to USA, via Bermuda. The Australia-England Empire service was re routed via the Horseshoe Route following the declaration of war on England and France by Italy on 10th June, 1940. Nice item. WWII high frank censored 'All The Way By Air' Trans Pacific airmail cover from the Basrah Petroleum Company Ltd to New York, bs 28/8, via Honolulu 23/8, registered (label) cover, 21x10 cm, franked 65 fls on front and 320 fls verso, canc Basrah cds, ms 'Trans Pacific/A ir Mail', two wax company seals, sealed with ? India brown/red 'Passed By Examiner' with small red 'lion and unicorn' hs. 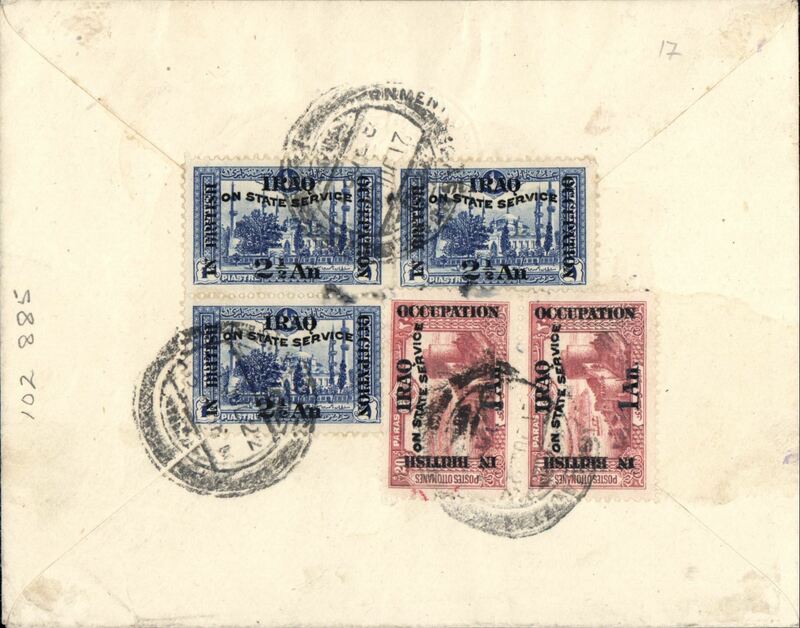 Wartime censored mail from Iraq is uncommon, particularly Trans Pacific. Posted at the time of the Anglo-Iraq war when British forces were protecting UK oil interests. Likely flown BOAC to Singapore, Pan Am FAM 14 to San Francisco, and US internal air service to New York. A scarce item with great routing. Image. F/F FAM 27 Basra to New York, cachet, b/s, TWA. 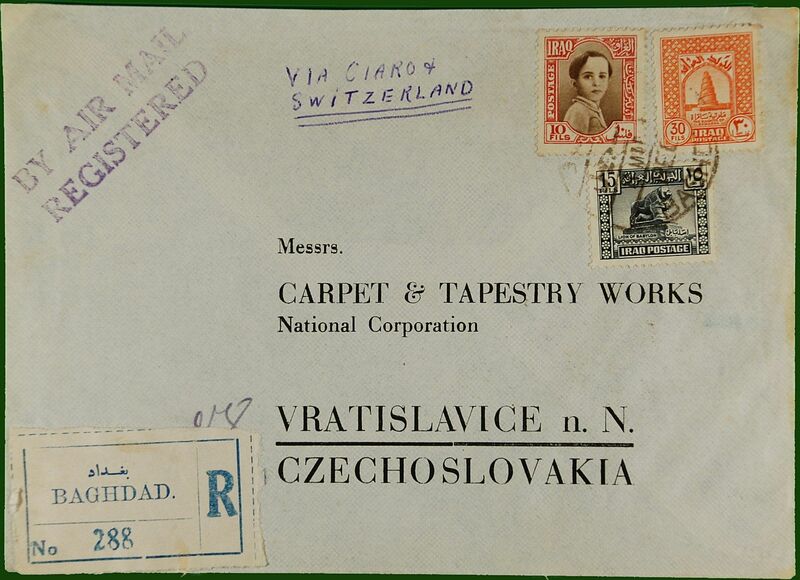 Commercial air registered (label) cover to Carpet and Tapestry Works, Vratislavice, Czechoslovakia, bs Prague 15/3, franked 55fls canc Baghdad cds, ms endorsement "Via Cairo and Switzerland", violet two line "By Air Mail Registered" hs. 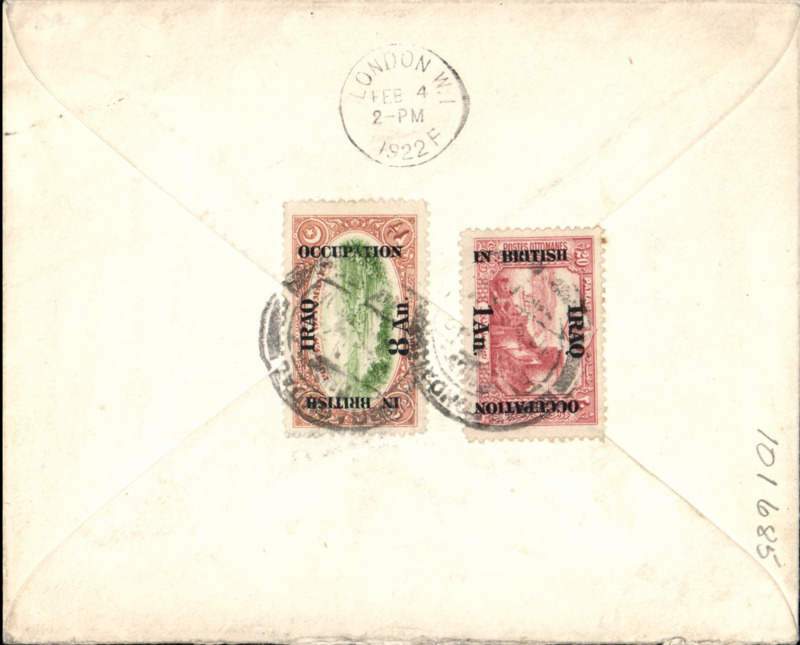 Basrah to England, no arrival ds, air letter franked block of 10fl x4. 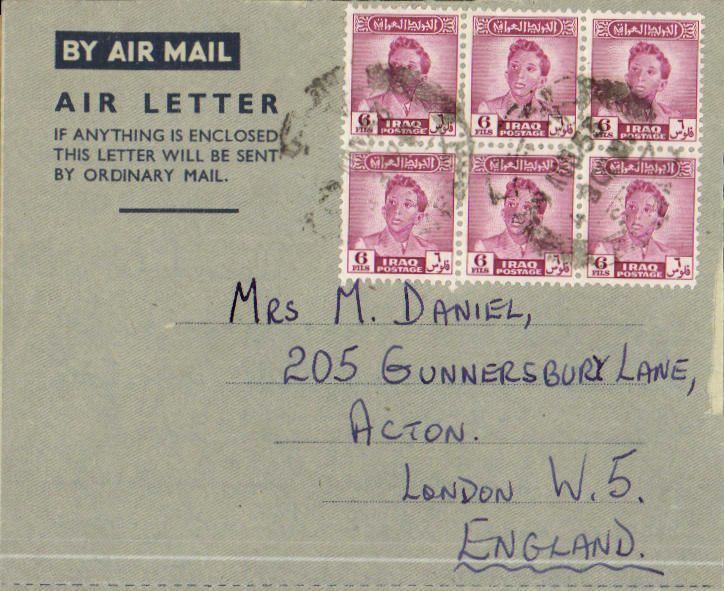 Basrah to England, no arrival ds, air letter franked block of 6fl x6. 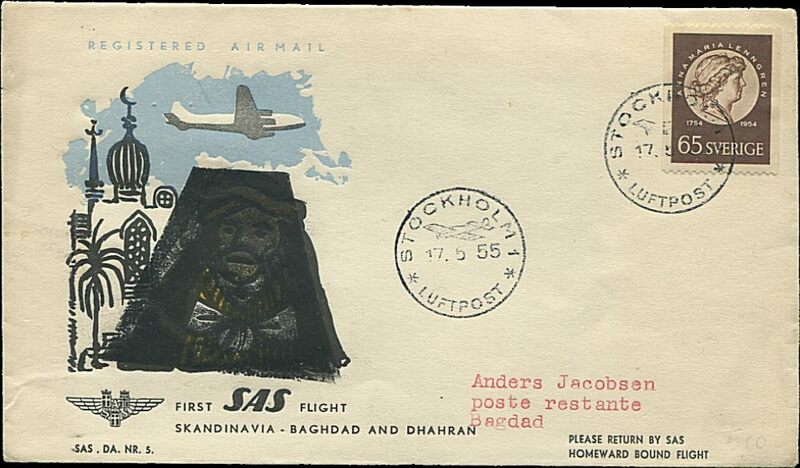 SAS 'Mail War' F/F DC6 Stockholm to Baghdad, bs 18/5, printed souvenir cover, franked 65o. These covers were made by the Danish Philatelic Club and showed, as a special imprint, the head of an Arab. The Iraqui authorities confiscated all the mail and only after lengthy negotiations and after the 'portrait' had been obliterated by a black colour was the mail returned. 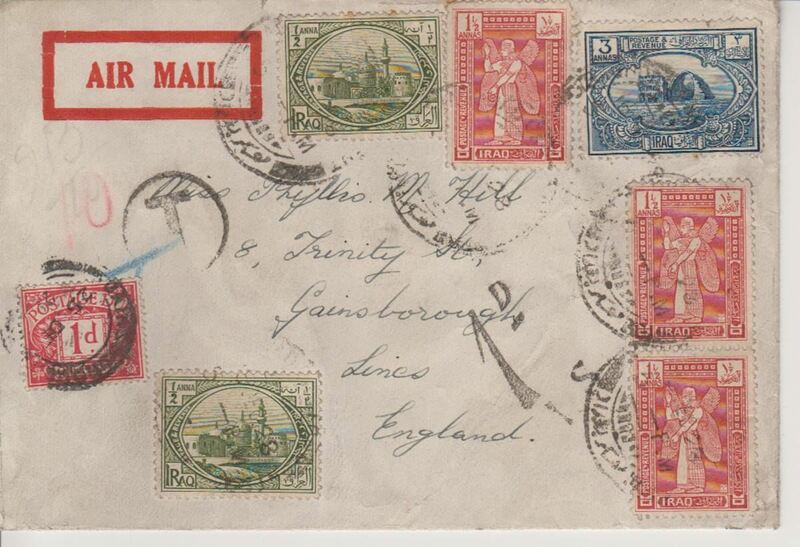 This is the first known "Mail War" case after World War II which explains the unusually high price for this item.